Every moment of every day we have thoughts running through our minds. We have memories, we have reasoning processes, we form thoughts as we react to observations we make and as we interact with other people. 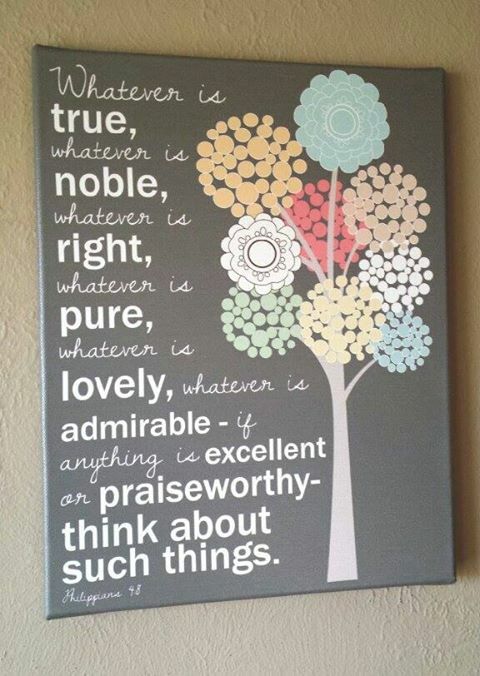 Thoughts form the springboard from which we act, and there is much more to thinking than we think. We can’t always control the origin or stimulus for the thoughts we produce, but we do have power to direct our thoughts. Have you noted the patterns your thinking takes throughout the day? Are you aware of how powerful thought is and the fruit it produces? Without getting into in-depth scientific and sociological explanations and discussions, I have a suggestion that can change your life as you act on it. It’s that simple. Change your life by changing your thoughts. There’s a verse in Philippians that admonishes us to do just that. Philippians 4:8,9 Finally, brethren, whatsoever things are true, whatsoever things are honest, whatsoever things are just, whatsoever things are pure, whatsoever things are lovely, whatsoever things are of good report; if there be any virtue, and if there be any praise, think on these things. “Think on these things…” and “the God of peace shall be with you.” Do you want peace in your life? Control your thoughts. You have the power, through God’s spirit within you pmce you’ve been born again, to control what you think about. You can’t always control the initial thought, but you can replace those initial thoughts quickly with godly thoughts. You are in control. What’s the benefit? The God of peace shall be with you. God is our Father. He wants us to trust him. Negative thoughts leave no room for God to get in there. Praying and directing our thoughts to those things that are pure, lovely and virtuous sets our hearts in alignment with God and allows him to work in your lives. Controlling thoughts can be hard at first, especially if you’ve let your mind run rampant most of your life. You have to take control and replace ‘wrong’ thoughts as they come up with ‘right’ thoughts. As you do this over a period of time, you’ll find it much easier and sooner or later, ‘autopilot’ will kick in and you’ll find yourself thinking godly thoughts much more naturally and regularly. Your thought patterns will actually change — new neuron paths will be formed and you’ll find it much easier to have what God says is a healthy mind set. This process is called ‘renewing your mind” in Romans. God’s will for your life is that you become more like Jesus Christ. God wants you to be victorious in life. God wants you fulfilled. God wants to give you the desires of your heart that line up with his will. Change your thinking to agree with God and his Word and you will change your life. Renew your mind and God will renew you. I’m not a ‘positive thinker’ per-se but I do believe that when our thoughts agree with God’s then we have his power in our lives. As we tune into God through his Word and prayer, I do believe that we open ourselves to him working in our lives in powerful ways. Take care to watch what you think. Make a deliberate effort to change your thoughts to agree with God’s Word and see the power of God working in your life. Change your thoughts and your life will change as well.